1974: The first flyby of the planet Mercury takes place. Mariner 10 was a robotic space probe launched by NASA on November 3, 1973. The mission was to pass by Venus and Mercury and perform experiments to get data to help with future projects. The science team was led by Bruce C Murray and the Jet Propulsion Laboratory (JPL). The mission was the first to use interplanetary gravitation for a slingshot maneuver where Venus was used to bend the flight path into Mercury’s path. It was also the first spacecraft to use solar pressure as a means of flight control. Mariner 10 performed seven different experiments and six of these had dedicated equipment with which to perform the task. There had been 46 submissions for hoped for experiments and JPL selected these seven based on maximizing scientific discovery while remaining in the budget guidelines. The total cost of the experiments was $12.6 million, about 12% of the total budget of the mission. Another consideration was the weight of the spacecraft and all equipment. Mariner 10 weighed in a 1,109 pounds at liftoff which took place at 12.45 Eastern Time on November 3 where it was put into a parking orbit. When it reached the correct spot, another burn pushed the craft out of the Earth Moon system. The three month trip to Venus proved less than smooth sailing. Several technical difficulties arose and one problem would be fixed only to have another one crop up. Mariner 10 passed Venus on February 5, 1974 with the closest approach being 3,585 miles from the planet. She was the twelfth spacecraft to reach Venus and the first to send images back to Earth. As the spacecraft circled Venus and using the gravity assist, a new course was set and her speed dropped from 82,785 mps to 72,215 mph, allowing for an elliptical orbit around the Sun to intersect Mercury’s orbit. Mariner 10 flew by Mercury three times. On this day, at 20.47 UT at a range of 437 miles, she passed on the shadow side of the planet. The first time an Earth ship went to visit the small Sunside planet. Mariner 10 made one trip around the Sun while Mercury made two and then passed again on September 21, this time at a more distant range of 29,869 miles. NASA lost roll control in October, but there was still a third encounter with Mercury. The closest and last pass took place on March 16, 1975 at a distance of 203 miles. The maneuvering gas was nearly gone but tests were continued until March 24 when the final nitrogen gas ran out. It is presumed Mariner 10 is still orbiting the sun but it was decommissioned when the nitrogen gas was gone. March 29, 1683: Yaoya Oshichi dies. She was the daughter of a greengrocer Tarobei and her name literally means simply greengrocer Oshichi. The family lived in the Hongō neighborhood of Edo. Edo, which translates to English as “bay-entrance” or “estuary” was the former name of Tokyo. Edo was the seat of power for the Tokugawa shogunate which ruled Japan from 1603 to 1868. In December 1682, Yaoya met and fell in love with Ikuta Shōnosuke, a temple page, during the great fire in the Tenna Era. They met at Shōsen-in, the family temple. Hoping to meet the young man again, Yaoya attempted to start another fire, thinking it would bring him close again. Instead she was arrested. Although the magistrate at the trial understood how old the young girl was, he asked if she was fifteen. She truthfully answered she was sixteen. The judge understood the consequences of such an answer. At the time, meticulous records were not kept and so it was possible to just ask and have the age confirmed by a local bureaucrat. The magistrate tried again and Yaoya, misunderstanding his intention which was to try her as a minor, again answered that she was sixteen. In accordance to the law, she was tried as an adult. The punishment for arson was to be burned at the stake and she died in that manner on this date. Three years later, her story was incorporated into Ihara Saikaku’s book, Kōshoku Gonin Onna (English translation, Five Women Who Loved Love). In 1703, Ki no Kaion, using the story as a basis for his work, created a traditional puppet performance entitled Yaoya Ohichi. Seventy years after that, three playwrights took liberties with revising Kaion’s work. In 1773, two plays had Yaoya climbing a fire tower to ring a fire bell and call to her lover, rather than being an arsonist. The penalty for falsely ringing the bell was still death. In the plays, Oshichi is treated as a noble character of selfless devotion rather than an impetuous and foolish girl. The calendar then in use in Japan had each year known by one of five element and one of twelve animals so that there was a series of sixty years. Oshichi was said to have been born in 1666, the year of the fire horse (Hinoe Uma [Japanese] or Bingwu [Chinese]). Every sixty years since this date, fewer children are born in such a year since it proved to be so unlucky. It is the 43rd combination possible in the cycle. The risk of having a child born with such a bad personality makes the birth rate drop during the year in East Asian countries. This is true even now, with the last such year having been in 1966. The next fire horse year will take place in 2026. Also on this day: Rationing – In 1948, rationing of items increased to include more food products. Ice Jam – In 1848, the Falls at Niagara stopped flowing. Vesta – In 1807, Vesta was discovered. New Sweden – In 1638, the first Swedish colony was established in the New World. Knights – In 1882, the Knights of Columbus was formed. March 29, 1882: The Knights of Columbus (K of C) is formed. Irish-American Catholic priest Michael J. McGivney founded the fraternal order in New Haven, Connecticut. A group of men from St. Mary’s Parish first gathered on October 2, 1881 and the Order was incorporated under state laws on this day. All the beginning groups were founded in Connecticut but soon after they spread to other New England states and finally to across the nation and eventually, around the globe. Today, it is the largest fraternal order in the world. McGivney wanted to provide for the poor families of his immigrant-laden parish. When the main income earner died, the entire family suffered and the priest wanted a way to provide for the widows and orphaned children. At the time, Catholics were often barred from joining labor unions or other organizations. Sometimes the groups, like the Freemasons, did not permit Catholics to join and sometimes the Church forbade them from joining a group. McGivney wanted to form a group of men who would be able to secure insurance to keep their families protected in the event of an early death, a dire possibility at the time. He traveled to other places nearby and found groups of collectives who were able to purchase the beneficial life insurance. These other groups were able to offer the insurance, but not across state lines. The name of Columbus was chosen in part as a rebuke to the Angle-Saxon Protestants who honored Christopher Columbus, a Catholic explorer, as founder of the Americas while excluding other more recent immigrants practicing the Catholic faith. Columbus had not yet been vilified and was actually seen as having done something good and honorable when he landed in the New World. McGivney hoped to name the new group the Sons of Columbus, but James T. Mullen, the first Supreme Knight, convinced him to go with the feudal reference. The original benefit was to be $1,000 given to a recent widow. Each member was charged $1 when someone died and when there were more than 1,000 members, the charge was lowered to reflect the greater pool of contributors. They also created a Sick Benefit Deposit for members who were ill and couldn’t work. Their families would draw $5 per week for 13 weeks. If they remained unable to work for a longer period, some other sum of money would be allocated. Today, there are over 1.8 million members in over 15,000 councils. In 2012, the K of C donated over $167.5 million directly to charity and performed over 70 million man-hours of volunteer service. They donated over 413,000 pints of blood in 2010. Their life insurance program has more than $90 billion in policies backed by $19.8 billion in assets. March 29, 1848: Niagara Falls stops running. The last glacial period began about 110,000 years ago and ended between 10,000 and 15,000 years ago. Glaciers advanced and retreated throughout the ice age. Ice sheets and glaciers covered a large part of the Northern Hemisphere and a smaller portion of the Southern Hemisphere. While most of Canada and the northern part of the US were covered with ice, Alaska was not due to oceanic fluctuations in water movement. In Europe and Asia, the Scandinavian ice sheet crept over the north of Britain, Germany, Poland, and Russia. As the Wisconsin glaciers retreated, they carved out the Great Lakes – a series of five Lakes acting as a border between Canada and the US. Lake Superior and Lake Michigan drain into Lake Huron which in turn runs into Lake Erie and on to Lake Ontario via the Niagara River. There are two major sections of the Niagara Falls separated by Goat Island sitting in the middle of the Niagara River. On the Canadian side of Goat Island are the spectacular Horseshoe Falls, the portion usually seen in pictures. On the American side are the American Falls and the smaller Bridal Falls. The Falls are not particularly high with the Horseshoe Falls dropping 167 feet and the American side crashing into crumbled boulders only 70 feet below. The Falls are wide. The American side is 1,060 feet at the brink and 150,000 gallons per second flows past. The Horseshoe Falls are 2,600 feet at the brink and drains 600,000 gallons per second. The tremendous power of the water rushing past on its way to Lake Ontario, and eventually to the Atlantic Ocean, has been harnessed on both sides. There are 3 hydroelectric plants with the Sir Adam Beck 1 and 2 on the Canadian side and the Robert Moses Niagara Power Plant on the American side. They generate about 4.4 gigawatts of power. The torrent of water doesn’t freeze in winter although ice can form reaching from either side of the river. If the ice meets in the middle, an ice bridge forms. Water can flow under these bridges. Mini-icebergs flow from the frozen shores of Lake Erie. These can impede the flow of water on the Niagara River. Only once in recorded history has Niagara Falls stopped. An ice jam up river caused the Falls to dry up for several hours. The Falls didn’t actually freeze over, there was just no water getting to them. People walked out on the riverbed looking for treasure. This article first appeared at Examiner.com in 2010. Editor’s update: The Niagara Escarpment is a long cuesta or geological sloping of the ground between Canada and the US. It runs, for the most part, east/west from New York State through Ontario, Michigan, Wisconsin, and Illinois. It is along this route that Lake Superior, Lake Michigan, Lake Erie, and Lake Ontario run to the falls. It is named for its most famous feature, the falls where Niagara River tumbles downward. While escarpments are often along fault lines, rock exposure and drillholes show that the line is not a fault line but came into existence due to unequal erosion. The limestone was less easily eroded than the shale and because of the two different rock structures and over millions of years, the escarpment came into being. March 29, 1638: The first Swedish colony is established in the New World. New Sweden included portions of what are today Delaware, New Jersey, and Pennsylvania. The Realm of Sweden was reaching its peak during this period. Through a series of wars, Swedish forces ruled several areas of Europe. Colonization in the New World was a logical move. The first Swedish expedition left for America in late 1637. The voyagers left from Gothenburg with Clas Fleming, a Finnish admiral in charge. Peter Minuet, a Dutchman, was to lead the expedition. Kalmar Nyckle, a pinnace, and Fogel Grip, a smaller ship, sailed past Cape May and Cape Henlopen and into the Delaware Bay. They anchored at a place today called Swede’s Landing. Their first order of business was to build a fortification which they named after their queen. Fort Christina was built at present day Wilmington. The Dutch had previously attempted to settle along the Delaware River and counted the regions as their territory. The Dutch and Swedes divided the area north and south of the river, leaving each with access to the lucrative beaver pelt trade. The Swedish colony began with holdings which included most of present day Delaware and then moved up the river to include sections of New Jersey and Pennsylvania. They eventually established four forts in Pennsylvania, one in New Jersey, and a second one in Delaware. They also founded seventeen permanent settlements. They were some of the early European settlers (along with the Dutch and British) to reside in the Philadelphia area. The Swedes controlled the area from 1637-1655 when the Dutch took over. The British took on nominal control of Philadelphia in 1664 and William Penn really changed things in 1682. New Sweden was governed by Johan Björnsson Printz from 1643-1653. Under his leadership, the colony expanded. In May 1654, the Swedes captured a Dutch fort without being fired upon – the Dutch were out of gunpowder. Dutch governor, Peter Stuyvesant, led a reprisal action (apparently with gunpowder) and retook the fort along with Fort Christina. The Swedish colony was incorporated into Dutch New Netherlands on September 15, 1655. Rationing – In 1948, rationing of items increased to include more food products. When he discovered a second asteroid five years later, he allowed Carl Friedrich Gauss to name it. Gauss chose the name Vesta. Ceres was the first asteroid to be discovered and was found in 1801 by Giuseppe Piazzi. It is the largest of the asteroids measuring about 590 miles in diameter. Even though the largest dwarf planet, containing about one-third of the total material of the asteroid belt, it is too dim to be seen with the naked eye. Olbers concluded, after finding another minor planet, that the asteroid belt existed and contained pieces of a planet that had been destroyed. Vesta is smaller than Ceres with a mean diameter of 330 miles. The mostly-ovoid planet contains about 9% of the asteroid belt’s matter and is only 28% as massive as Ceres. However, it is closer to Earth. About a billion years ago, Vesta was in a collision and lost about 1% of its mass. The debris from this event has fallen to Earth as Howardite-Eucrite-Diogenite meteorites and given us much information concerning the asteroid belt. The asteroid belt is a region of the Solar System between Mars and Jupiter. Most of the rock and ice found there are irregularly shaped asteroids. The four largest bodies [Ceres, Vesta, Pallas, and Hygiea] contain more than half of the matter in the belt. While other areas in the Solar System were managing to form into planets, the material in this region was so affected by Jupiter’s gravitational pull that the material held too much energy to stick together or accrete. Instead, the material was too violent and as collisions occurred, the protoplanet shattered. Iced over Niagara Falls – 1848, Niagara Falls stops running. March 29, 1943: In the US, rationing of meat, butter, and cheese is added to the list of already rationed products. The price of war is difficult to calculate. What price, what cost, what sacrifice is too great? During Word War Two there was a different perspective both to that war and to the costs people were willing to pay. The ration list grew longer as the war continued. Even before “globalization” the entire industrialized world was affected by the catastrophic economic force of the Great Depression. After years of going without the considered necessities of the day, Americans were again asked to go without –this time to sacrifice for what was deemed a greater good. The sacrifices made at home were to benefit those on the battlefields. Many, if not most, of the citizens at home during the war effort had someone actively participating in either the European or Pacific arena of World War II. Perhaps there was some personal reason for this “greatest generation” to forego luxuries or even necessities to help the “boys” overseas. 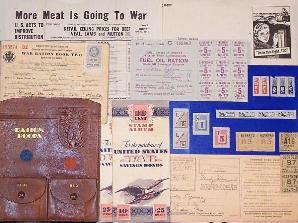 Rationing books and tokens were used. Items in short supply were limited, not by being able to afford them, but because the little available had to be shared by all. By the end of the war, half of all cars were issued an A sticker, meaning driving was for nonessential use. They were permitted four gallons of gasoline a week. Green B stickers went to those who worked in war industries and gave them twice as much fuel. Physician, ministers, mail carriers, and railroad workers got C stickers while T was for truckers. The rare X sticker, for unlimited fuel went to members of Congress and other VIPs. The maximum speed was the Victory Speed of 35 mph. Also on this day, in 1848 Niagara Falls stopped running due to an ice jam farther up river.